Sacking minor officials in front of an audience is only one part of Mr Magufuli’s authoritarian populism. Since coming to power in the country of 55m on the east coast of Africa in 2015, Mr Magufuli, nicknamed “the bulldozer” from his time as roads minister, has bashed foreign-owned businesses with impossible tax demands, ordered pregnant girls to be kicked out of school, shut down newspapers and locked up “immoral” musicians who criticise him. A journalist and opposition party members have disappeared, political rallies have been banned and mutilated bodies have washed up on the shores of Coco Beach in Dar es Salaam, the commercial capital. Mr Magufuli is fast transforming Tanzania from a flawed democracy into one of Africa’s more brutal dictatorships. It is a lesson in how easily weak institutions can be hijacked and how quickly democratic progress can be undone. Mr Magufuli was an unlikely candidate to run Tanzania. Though it has had multiparty elections since 1994, the country has been run exclusively by one organisation, Chama Cha Mapinduzi (CCM), the “party of the revolution”, since its formation in 1977. But unlike his predecessors, Mr Magufuli is no party man. In the nomination process for the election of 2015 he was not the favourite of any faction. Facing the biggest challenge to its rule since 1994, however, the party seemed minded to pick somebody with the aura of being an “outsider” who was not tainted by the allegations of corruption dogging it. Mr Magufuli seems to have won by having few enemies rather than many allies. Within weeks of taking office, he excited even sceptics. He turned up at offices to check if Tanzania’s famously lackadaisical civil servants were at work. Businesspeople swooned after he sacked dozens of officials suspected of cronyism. In neighbouring Kenya, where president Uhuru Kenyatta’s government has not prosecuted a single major corruption case in six years, fans demanded their own Magufuli. But the honeymoon did not last long. When Mr Magufuli last year presented Acacia, a London-listed gold-mining company, with a bill for $190bn in supposedly unpaid taxes (a figure equivalent to roughly four times Tanzania’s entire GDP), it was the latest confirmation that Mr Magufuli’s anti-corruption strategy is about as precise as a blunderbuss. He distrusts not only Western investors but also the Chinese, who are building infrastructure across east Africa. He tells his ministers that they are “not the same Chinese” as the Maoists who built the Tazara railway line linking Tanzania to Zambia in the 1970s. Rather than being freed from corruption, the economy is grinding to a halt under the weight of arbitrary tax demands. Mr Magufuli’s approach to political opposition is no better. 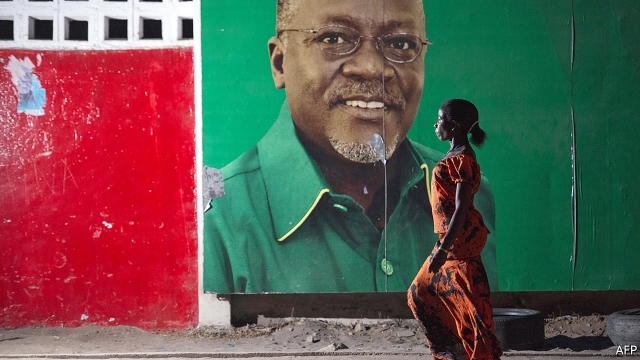 Though CCM has never lost an election, in recent years Tanzania’s politics did seem to have been opening up. Under Mr Magufuli, that has all changed. Less than a year after coming to power, he had banned all political rallies (the president gets around the ban himself by having “non-political” public events with civil servants). MPs are allowed to campaign only in their own constituencies (and several have been arrested). Several newspapers have been temporarily closed by the government, and two, linked to Chadema, an opposition party, remain so. Extrajudicial violence, which used to be almost unknown on the mainland, is escalating. In September Tundu Lissu, a prominent opposition MP, was shot and injured outside his house in Dodoma, the sleepy capital. Minor political figures have simply disappeared. Not all of the violence is by the state. Over the past year about a dozen police officers have been killed in Kibiti, a mostly Muslim coastal town about 70km south of Dar es Salaam. The police have seemingly responded in kind. Yet little news leaks out from the region. 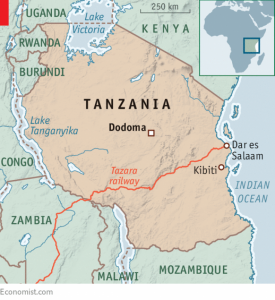 Foreign journalists are turned back long before they reach Kibiti; a Tanzanian journalist investigating the killings has been missing for three months. Tanzania’s politics have never been truly open, but what is different now is that even CCM, which is by far the country’s most stable institution, is cowed. Under Tanzania’s constitution, little changed since it was written in 1977 by Julius Nyerere, the country’s founding father, power is almost entirely concentrated in the presidency (Nyerere himself once joked to a BBC reporter: “I have sufficient powers under the constitution to be a dictator”). Mr Magufuli is both head of state and chairman of the party, with the power to hire and fire civil servants, including judges, as he pleases. On taking office, he quickly filled important posts in the government and the party with his own allies. Few are willing to speak up against the presidency, says one CCM MP. There is little hope of change coming through the ballot box since the opposition is crushed and the next election, in 2020, will probably be rigged. Nor is there much hope that the party can restrain Mr Magufuli. Some hope that Jakaya Kikwete and Benjamin Mkapa, two former presidents, can persuade him to change course. Others dream, seemingly forlornly, that the party will revolt. The main lesson of Tanzania is that constitutions which concentrate power in the presidency can quickly be subverted. Democracy flourished between 1994 and 2015 because the bigwigs in CCM saw the benefits of a more open, pluralistic economy. But they failed to do the tedious work of strengthening institutions and limiting the powers of their successors. Now they have lost their chance to embed the reforms and the country faces ruin. That should be a lesson to other African elites.